Enjoy Italian cuisine at DEI CAPPUCCINI, one of the hotel's 2 restaurants, or stay in and take advantage of the 24-hour room service. Snacks are also available at the coffee shop/café. Relax with your favorite drink at the bar/lounge or the poolside bar. Buffet breakfasts are available daily from 7 AM to 10 AM for a fee. Featured amenities include multilingual staff and laundry facilities. A train station pick-up service is provided at no charge at scheduled times, and free self parking is available onsite. Stay in one of 5 guestrooms featuring flat-screen televisions. Complimentary wireless Internet access keeps you connected, and digital programming is available for your entertainment. Private bathrooms with showers feature rainfall showerheads and complimentary toiletries. Conveniences include desks, housekeeping is provided daily, and cribs/infant beds (complimentary) can be requested. Make yourself at home in one of the 20 air-conditioned rooms featuring minibars. Complimentary wireless Internet access keeps you connected, and satellite programming is available for your entertainment. Private bathrooms with bathtubs or showers feature bidets and hair dryers. Conveniences include safes and desks. Enjoy Mediterranean cuisine at La Bussola, a restaurant which features a bar, or stay in and take advantage of the room service (during limited hours). A complimentary hot/cold buffet breakfast is served daily from 7:30 AM to 10:00 AM. Amalfi Luxury House is in the heart of Amalfi, within a 5-minute walk of Cloister of Paradise (Chiostro del Paradiso) and Amalfi Beach. 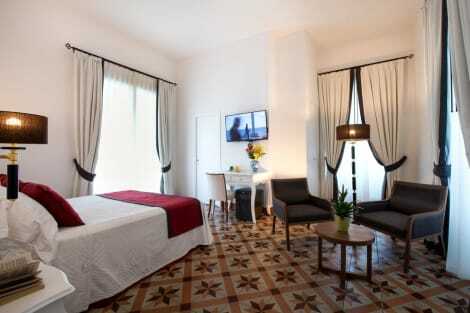 This bed & breakfast is 3.1 mi (5 km) from Maiori Beach and 18.9 mi (30.4 km) from Corso Italia. Take in the views from a rooftop terrace and a garden and make use of amenities such as complimentary wireless Internet access. Additional amenities at this hotel include concierge services, babysitting/childcare (surcharge), and a television in a common area. Guests can catch a ride to nearby destinations on the area shuttle (surcharge). Featured amenities include a business center, express check-in, and complimentary newspapers in the lobby. 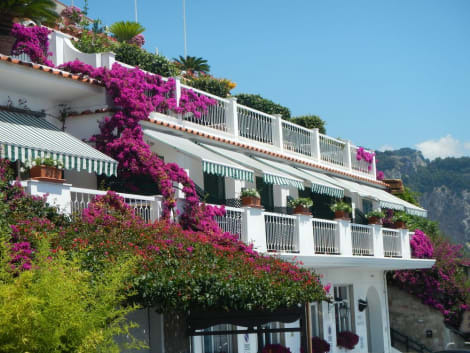 Planning an event in Amalfi? This hotel has 3229 square feet (300 square meters) of space consisting of a conference center and a meeting room. Relax on the private beach or enjoy other recreational amenities such as an outdoor pool. Additional features at this hotel include complimentary wireless Internet access, a television in a common area, and tour/ticket assistance. Enjoy Mediterranean cuisine at Santa Caterina, one of the hotel's 2 restaurants, or stay in and take advantage of the room service (during limited hours). Snacks are also available at the coffee shop/café. Relax with your favorite drink at the bar/lounge or the poolside bar. A complimentary continental breakfast is served daily from 7 AM to 10:30 AM. Hotel is in a charming location. At Amalfi facing the sea and with a magnificent view that goes from Capri all the way to Positano and to Amalfi. The ideal place for a vacation filled with relaxation, sea, good cooking but also with excursions discovering the lands and the seas of mythical Mermaids, of Positano fashion, art and history of Amalfi. Stay in this ancient Arab fortress built into the cliffs of the Amalfi Coast, and enjoy stunning sea views from the rooms, the panoramic pool, the sun deck, the terrace bar and beach free for hotel guests. Only the guests of hotel have the privilege of living these atmospheres, beauty, comforts and services in one of the most appreciated 5 star hotels of Amalfi and of the Amalfi Coast. It features panoramic rooms in a stunning coastal location. Enjoy the antique furnishings, the Arab decoration, and modern comforts such as sea view, air conditioning, telephone, satellite TV, mini-bar, safe and hairdryer. A large and sunny outdoor swimming pool with beach umbrellas and beds. The sea and land fragrances of the Peninsula of Sorrento may be found in the typical cuisine of the Campania Region served by the restaurant of Il Saraceno Grand Hotel to its guests and to anyone that wishes to try the traditional dishes of the Amalfi Coast. By car grom either north or south, take the A3 Napoli-Salerno motorway, following the directions for the Costiera Amalfitana until the exit for Vietri sul Mare. Then follow state highway SS 163. 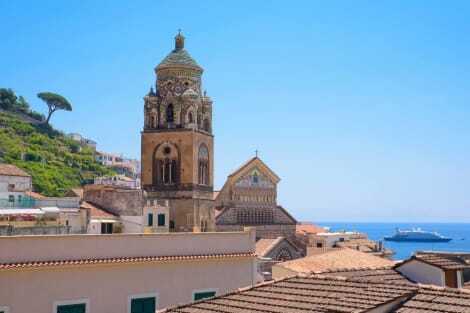 Pass through the towns of Vietri sul Mare, Cetara, Maiori and Minori before arriving in Amalfi. lastminute.com has a fantastic range of hotels in Amalfi, with everything from cheap hotels to luxurious five star accommodation available. We like to live up to our last minute name so remember you can book any one of our excellent Amalfi hotels up until midnight and stay the same night.